size and long lifespan, and can be applied in harsh environments. LEDs convert approximately 20% of their input power into light energy, whilst traditional incandescent bulbs generally only convert about 2% of their input power into light. As a result LED technology offers excellent energy efficiency, making it a cost effective and environmentally-friendly solution for modern light-emitting devices. Conventional incandescent technology is based on electron’s travel through a tungsten filament, causing the filament to generate temperatures up to 2,500 degree Celsius, with light energy merely a byproduct of this process. Due to this inherently inefficient mechanism, incandescent bulbs rapidly deteriorate and burn out after about 1,000 hours of use. LEDs, on the other hand, operate on an entirely different principle.While they do require specialized components to achieve maximum brightness, a working lifespan up to 50,000 hours is possible, with a gradual fading of brightness rather than instant burn-out. Due to the absence of a delicate filament and thin glass bulb, LEDs can withstand shock and vibration far stronger than incandescent lamps, making them ideal for rugged and demanding applications. An incandescent bulb generally takes about 100-300 milliseconds to illuminate once activated, while an LED needs only a few nanoseconds, giving it a significant advantage in highly demanding applications. NITECORE’s highly efficient, ultra reliable proprietary LED drive circuit plays a crucial role in efficiently transferring battery power to the LED. As a result, all NITECORE products have exceptional output and long runtimes in comparison to competing products. 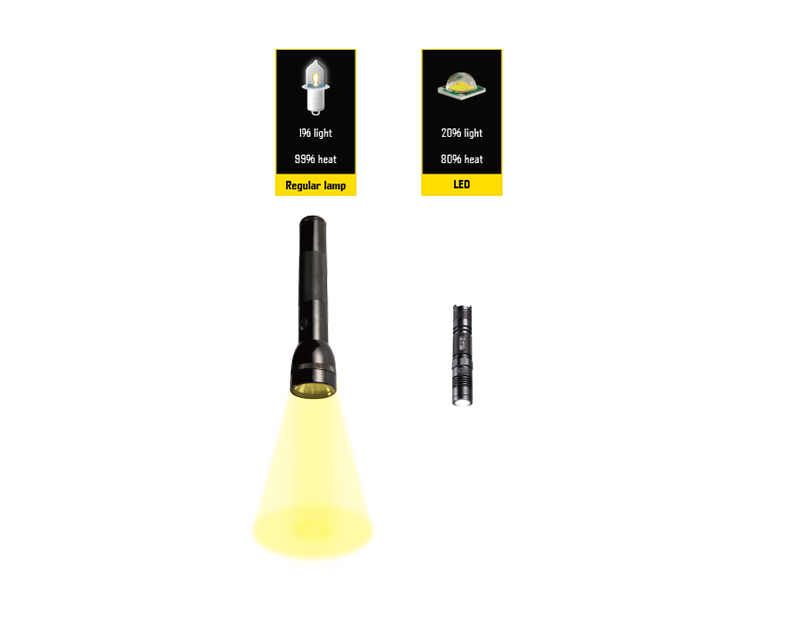 While the majority of LED-based flashlight/ personal lighting products on the market today suffer from continuously declining output, NITECORE products are able to maintain constant high output until battery exhaustion.